My kids and I are really concentrating on the true meaning of Christmas this year. Not that we don’t every year, but to tell the truth, we still watch the usual Christmas movies: Rudolph, Santa Clause is coming to town, Santa Buddies, etc. Not that there’s anything wrong with those movies, I actually really like them. But we are trying to remember the true meaning of Christmas and leave out as much of the commercialism as possible. Enter the gift tags. I picked up a package of gift tags from a store and brought them home, not thinking anything about it. Fast forward to this week when my boys are wrapping each other’s gift and I pull out the gift tags. They are pictures of Santa, the elves, reindeer, and the usual “Christmas” pictures. They’re really cute, but not the true meaning of Christmas. 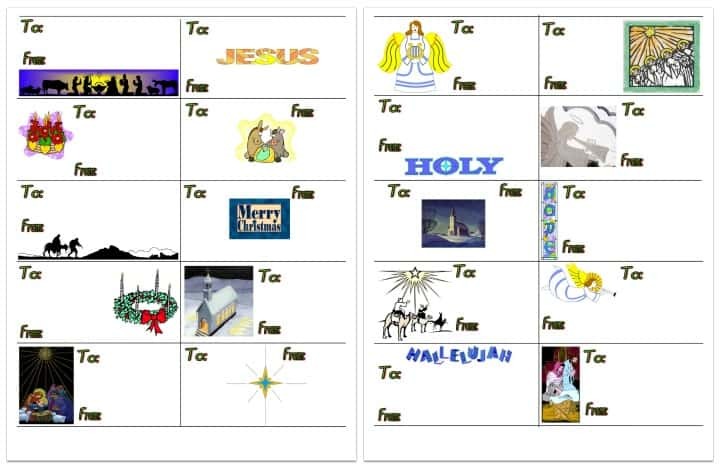 So I decided to make just some simple gift tags that had pictures that represent the true meaning of Christmas. There are angels, advent wreaths, the nativity, etc. Nothing fancy. But true. I hope you enjoy these. Print them out on card stock, cut them out, hole punch the corner, and string some ribbon through. Sometimes it’s the simplest things that help us to remember why we celebrate this time of year. Thank you so very much . . . I love these gift tags. Tony Kummer (Editor) reviewed & updated this page on : December 15, 2015 at 9:11 am. All our content is peer reviewed by our readers, simply leave a comment on any post suggest an update.